Sure, it’s January 14th, 2012 – marking a year after Ben Ali’s departure from Tunisia. When he fled, most Tunisians were not sure whether they were witnessing reality or a mere passing dream. 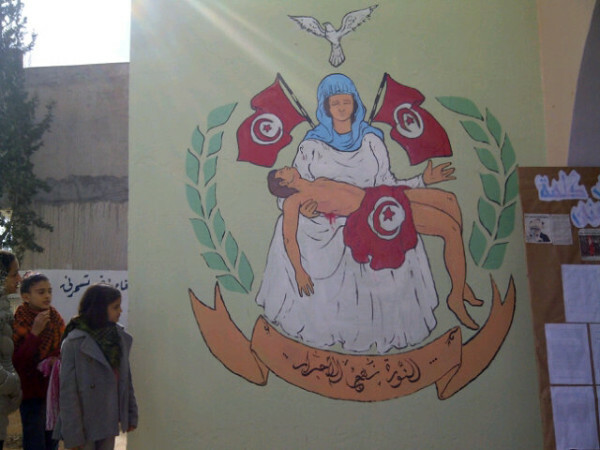 The ecstasy in the air was a collective one that united all Tunisians. But in memory of this moment of ecstasy, Tunisians are celebrating separately. In La Chebba, a small city in the coastal state of Mahdia, two celebrations were taking place: supporters of the Islamist party Ennahda held celebrations at a local park, while supporters of left-wing parties (including Ettajdid, the Progressive Democratic Party, and the Tunisian Communist Party) held a march down Chebba’s main street. They chanted, “No America, no Qatar, Tunisia is free,” along with a dash of, “We say no to backwardness – no caliphate.” Now, while I agree wholeheartedly with the general message of non-intervention, I sometimes question why they think today of all days is a good day to spread it. All it takes is a glance over their shoulders to notice that the lady living down the street cannot afford to buy a bottle of gas to cook with. All it takes is a short walk across the street to hear a mother complain about how ever since her children reached 5th grade, she can no longer help them with their homework. The celebrations in the park, on the other hand, were insulated. They insinuated a completion of the “revolution.” It’s all said and done for many of those present – democracy, new government, mission accomplished / la vie en rose. The party they voted for won, and given some ingrained cultural vestiges left by the old regime, that’s more than enough to ensure stability and prosperity in the country. These ideological divisions are happening due to one reason: the government’s lack of direct and systematically executed communication with the residents of any Tunisian cities besides the capital. Tunisian leaders now have a new penchant for inviting foreign dignitaries day in and day out. Ever since its inception, all the new government has been doing is inviting various heads of state and making “agreements” – what they entail exactly, most of the Tunisian population has no idea. Some Constituent Assembly members, along with a few ministers, have made trips to the interior. On one of the trips to Gafsa, a minister witnessed yet another incident of self-immolation: Ammar Gharsallah, a father of three, lit himself on fire after the minister refused to meet with him. Gharsallah is unemployed and has actively participated in the sit-ins that have been taking place the past few weeks in front of the Gafsa governmental office. The acts of self-immolation happen for a reason: despair. I hate to be the one stating the obvious but it seems that many of our politicians do not understand how to allay this feeling. As PM Jebali invites Ismail Haniya, people are burning – if not literally, they are burning internally with despair. In Gafsa, Rdayef, Gassrine, and Sidi Bouzid. As Marzouki speaks with the Emir of Qatar, the President of Algeria, and Head of the Libyan transitional council Mustafa Abdul Jalil, Tunisians are striking. Protesting. Crying for attention from a most humble base. Life cannot – and should not – go as per usual until the demands of these protesters are met. Even though its only been a year since the former regime was overthrown, the months pass by as an eternity for many who, with thwarted dreams, are still waiting. Waiting on remedial action from the new government. “But the government just recently got its act together – how do you expect them to meet the demands in a month?” This is what I’ve been hearing time and time again. I used to say this myself. This is what the government can do: instead of “visiting” Gassrine, perhaps they can jumpstart the reorganization of internal municipal structures while they’re there. They can start providing training for the enactment of internal democratic procedures. They can begin the development of the interior regions – not through agreements with the Qatari Emir, but rather from the bottom up. Ask local residents what they need – document their needs. Work with local civic organizations in doing so. Then, open up business bids to fulfill these demands. Then, show residents of the cities you are visiting progress reports. In the example of opening up of a new factory, a study can be distributed to local city councils detailing how much is invested in the project, expected output, expected number of jobs, expected net gain to the city. The government (health ministry) can also begin renovating and reconditioning local hospitals. The government can also start by organizing their own respective offices – dividing the workload appropriately and allocating adequate human resources to enter the long-neglected interior areas. I can really go on for another page about what the government can do. I understand that establishing a new political tone on the international stage is important. But what is more pressing are the domestic issues that absolutely must be faced. The celebrations held in a local cultural center in Melloulech (a small town about 13 kilometers away from Chebba) were the most heartwarming – and the most honest. There, a united group of local residents gathered for the unveiling of a freshly painted mural, and schoolchildren sang some songs honoring the uprisings. They also had a short play enacting the heroic sacrifices of the young men and women who were brave enough to bare their chests to live fire. They poignantly expressed solidarity with each other as Tunisians. At this celebration, no lofty debates about nationalism and communism and islamism took place. No highbrow mentions of a looming caliphate or an “unclean” media were made. Instead, the air was imbued with patient optimism that recognized the feats of the past while critically looking ahead.